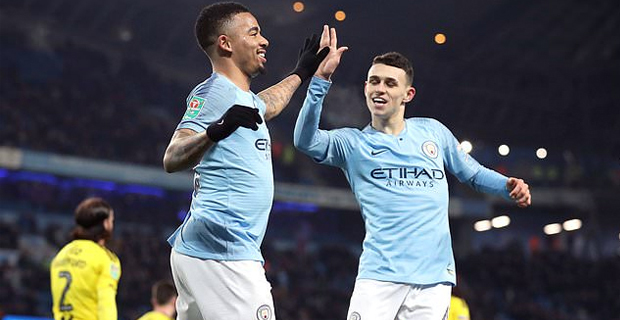 Manchester City scored nine goals as they thrashed Burton 9-nil with an incredible display of attacking football in the first leg of their Carabao Cup semi‑final at Etihad Stadium this morning. Gabriel Jesus scored four, with Kevin de Bruyne, Oleksandr Zinchenko, Phil Foden, Kyle Walker and Riyad Mahrez also scoring a goal each. Headers from De Bruyne and Jesus made it 2‑0, the Brazilian tapped in a third and Zinchenko's curler put City four up. City lead by 4-0 at halftime. Jesus added two more headers, with Foden, Walker and Mahrez scoring further goals. This was the first time in more than 31 years that City had scored more than eight goals in a single match ‑ they beat Huddersfield Town 10‑1 in a second‑tier league encounter in November in 1987. It means City have scored 16 goals in four days after thrashing Rotherham United 7‑0 in the third round of the FA Cup on Sunday.